Adorable cup cozy pattern, perfect gift idea for coworkers, family, and friends. 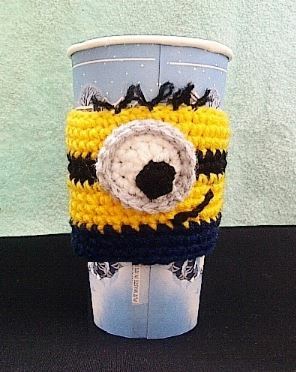 This Minion will keep your hands comfortable whether your cup is Hot or Cold. Also great to catch that little drip down the side of the cup before it creates a water-mark ring on your table, lol. The pattern makes up quickly and with very little yarn needed.